Before the party, give all the guests to your child’s birthday party a photo t shirt with your child’s picture on it. The birthday girl or boy will be thrilled as the guests all file in wearing the shirts. If the birthday party is at a theme park the shirts can also help you to keep an eye on all the kids more easily. 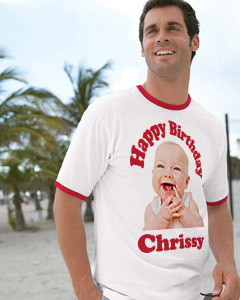 A fun idea for an adult birthday is to create a shirt that features the person being celebrated when they were still a baby. A photo shirt with a group shot of the last family reunion is a great item to include in gift bags for those attending reunions. Of course, you can also send the custom t shirts ahead of time so that attendees can wear them to the reunion. Whether you want custom photo shirts for personal or business use, it’s important to be able to order them without a hassle. Getting the shirts fast is also important to many of our customers. Your order of one shirt to 1000 shirts will ship fast, and you’ll always have easy access to our helpful and knowledgeable customer service staff. All of our products are of the highest quality. We use a heat-applied transfer process that ensures the photos will be clear and bright and that they will last. We offer a selection of colors and styles to suit all of your needs. You can also add a message to your photo t shirts. We can use vinyl letters or CAD cutouts to add names or messages to the front or the back of your photo shirts. To order your custom photo shirts, start by sending us your artwork or pictures. The files should be in JPG or PSD format and can be up to 10 MB. If you prefer, you can send TIF or PNG files that are up to 4 MB. We recommend that you print the picture at home in the same size you’d like it to on your custom photo shirt. This will give you a good idea of how the final product will look. For more information or assistance call 412-233-3555.